As I’ve often said on this blog, once you’ve eaten eggs from hens raised naturally, you’ll never want to eat the factory-produced kind again. It’s easy to tell a real farm egg from the factory variety. Try this simple test. Just crack open two eggs onto a plate–one from a supermarket and one from a local farmer. The supermarket egg will have a runny yellow yoke. The farm fresh egg will have a firmer yoke, orange in color. Here’s a photo I took demonstrating this. Of course, the farm fresh eggs not only look better, but they taste much better as well. After eating real eggs, the supermarket eggs seem bland and tasteless. 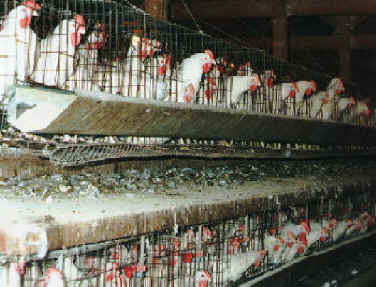 If consumers were aware of the cruel, unsanitary and unnatural way these hens are kept, I suspect many would refuse to buy the eggs. But the vast majority remain in a state of ignorance, so the practices don’t change. A final few thoughts about this. Don’t be fooled by supermarket packaging which says “free range” or “cage free.” Government regulations permit such deceptive language as long as the facility has a “porch,” which the hens can theoretically visit. In fact, they’re almost always kept inside under lights eating cheap unnatural food. The ultimate test is appearance and taste. Open one of the eggs and if it is yellow and runny, then it’s still just a factory egg. If you can’t keep a few chickens yourself, find a local source for real eggs. You’ll be glad you did.